The Osun State Election petition tribunal on Friday declared Senator Ademola Adeleke winner of the September 22nd governorship election in Osun State. 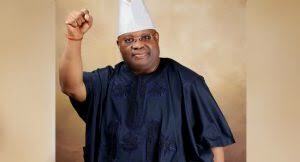 Senator Adeleke was declared winner after having fulfilling all the condition of the law. However the certificate of return issued to Gboyega Oyetola has been ordered to be withdrawn with immediate effect and fresh certificate be issued to Ademola Adeleke.